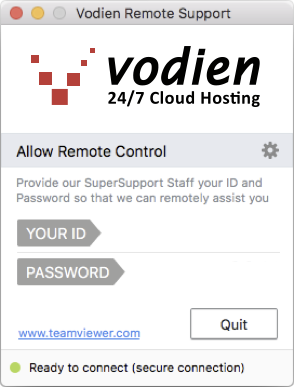 At times, Vodien SuperSupport Staff may require to remotely access your machine to help you troubleshoot. We use TeamViewer Software to provide remote desktop assistance. How does Remote Help work? to your desktop and install. your ID Number & Password. 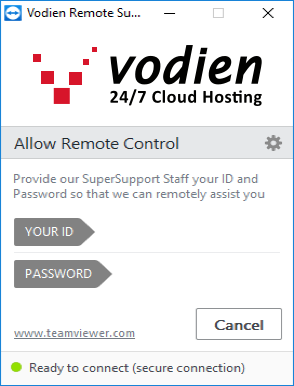 Once you have downloaded and installed the TeamViewer application, inform our Vodien SuperSupport Staff of your ID and password. Vodien SuperSupport will now login, troubleshoot and attempt to solve the difficulties faced. You can watch on your screen every step that we do. TeamViewer gives us the ability to be with you as if we're sitting beside you. *Once you close the application, Vodien will no longer have access to your desktop again.